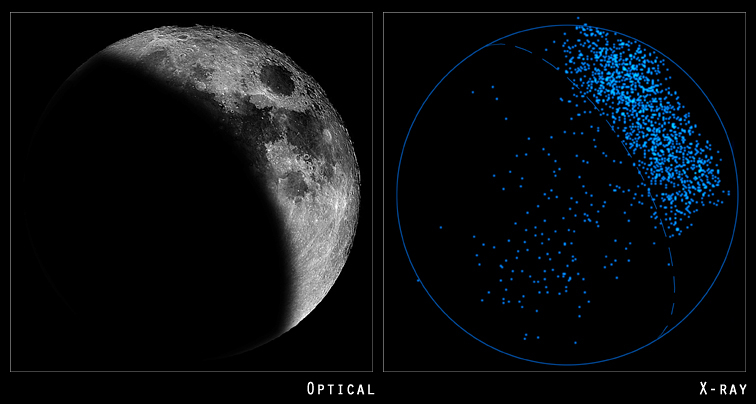 The Chandra observations (right) of the bright portion of the Moon detected X-rays from oxygen, magnesium, aluminum and silicon atoms. The X-rays are produced by fluorescence when solar X-rays bombard the Moon's surface. According to the currently popular "giant impact" theory for the formation of the Moon, a body about the size of Mars collided with the Earth about 4.5 billion years ago. This impact flung molten debris from the mantle of both the Earth and the impactor into orbit around the Earth. Over the course of tens of millions of years, the debris stuck together to form the Moon. Measuring the amount and distribution of aluminum and other elements over a wide area of the Moon will help to test the giant impact theory. Chandra's observations have also solved a decade-long mystery about X-rays detected by ROSAT that were thought to be coming from the dark portion of the Moon. It turns out that these X-rays only appear to come from the Moon. Chandra shows that the X-rays from the dark moon can be explained by radiation from Earth's geocorona (extended outer atmosphere) through which orbiting spacecraft move. 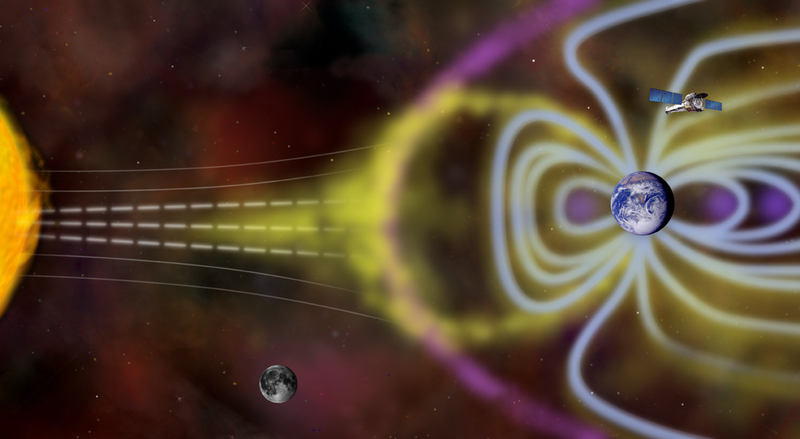 The geocoronal X-rays are caused by collisions of heavy ions of carbon, oxygen and neon in the solar wind with hydrogen atoms located tens of thousands of miles above the surface of Earth. During the collisions, the solar ions capture electrons from hydrogen atoms. The solar ions then kick out X-rays as the captured electrons drop to lower energy states. Credit Optical: Robert Gendler; X-ray: NASA/CXC/SAO/J.Drake et al. Coordinates (J2000) RA 12h 02m 31.55s | Dec -13° 45' 57.52"